The Niwaka festival was performed in the Yoshiwara pleasure quarter in the 8th month each year and consisted of spirited entertainments, including burlesques of classical themes, sometimes improvised, sometimes amateurish kabuki productions, performed by courtesans, geisha, owners of teahouses and brothels, and servants or attendants. By the end of the 18th C, the niwaka were elaborate festivals involving parades with floats bearing courtesans performing to music. Another 'oiran' named Mume (not depicted) is also listed in the role of Ujibei. In addition, the chanter for the performance is named (Takemoto Kumedayu) as are the instrumentalists (Tsurusawa Kiichi and Nozawa Hisara). The print shown here is titled Seirô niwaka zensei asobi: Ni no kawari ("Popular Entertainment at the Niwaka Festival, Yoshiwara: Second Transformation"). 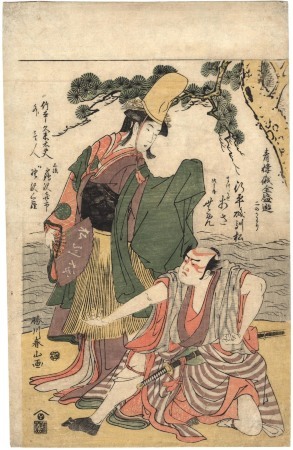 The two performers are shown in an entertainment titled Yukihira iso no narematsu ("Practicing Yukihira and the Pine Tree at the Seashore"). The female figure is a high-ranking courtesan, the oiran Asa, in the role of Matsukaze, while a male performer plays an unidentified role (possibly the fisherman Konohei). Another oiran named Mume (not depicted) is also listed in the role of Ujibei. In addition, the chanter for the performance is named (Takemoto Kumedayû) and the instrumentalists (Tsurusawa Kiichi and Nozawa Hisara). At the lower left is the artist's signature, a kiwame ("approved") censor seal and the mark of the publisher Eijudô (Nishimura Yohachi). The subject portrayed in Shunzan's aiban-size print is based on a tale from the life of Arihara Yukihira (818-893), a poet of the first rank during the Heian Era and a prince who was exiled for three years to Suma on the shore of the Inland Sea. He becomes involved with two lovely shiokumi ("salt-scooping") sisters named Matsukaze and Murasame, who both fall in love with him. When he is recalled from exile, he writes a farewell poem promising to return and leaves it behind with his cloak and court hat (eboshi), hanging them on a pine branch. He never returns. A fisherman named Konohei informs the sisters that Yukihira has gone, whereupon Matsukaze plunges into madness over the loss of her lover. She puts on his cloak and dances the story of her tragic love, one of various kabuki dance sequences based on the Matsukaze story. There is also a Nô play titled 'Matsukaze' that is considered a masterpiece. In Shunzan's portrait Matsukaze is wearing Yukihira's eboshi and carrying his cloak as she stands before a painted stage scene of the pine tree at Suma Bay. We are provided with a glimpse of the production style of the Niwaka in the Yoshiwara, which in this case did not require full costuming, as the 'oiran' Asa still wears her own robes, merely wrapping around her waist a straw skirt in keeping with the role of the rustic Matsukaze. Shunzan and other ukiyo-e artists of the late eighteenth century frequently explored contrasts between the figures in their print designs. Here the male entertainer, striking a standard 'mie' ("display") of strength and power, is set against the refined and gentle form of Asa. The colors in this impression are well preserved and thus demonstrate how the natural dyes of the period actually looked: partly transparent and restrained without losing their range of expression. Halford, A. and Halford, G.: The Kabuki Handbook. Rutland & Tokyo: C.E. Tuttle, 1956, pp. 328-29. Keene, Donald: 20 Plays from the Nô Theatre. New York: Columbia University Press, 1970, pp.17-34. Leiter, S.: Kabuki Encyclopedia: An English-Language Adaptation of Kabuki Jiten. Westport: Greenwood Press, 1979, pp. 137, 259, and 363. Seigle, Cecelia Segawa: Yoshiwara: The Glittering World of the Japanese Courtesan. Honolulu: University of Hawaii Press, 1993, p. 108.